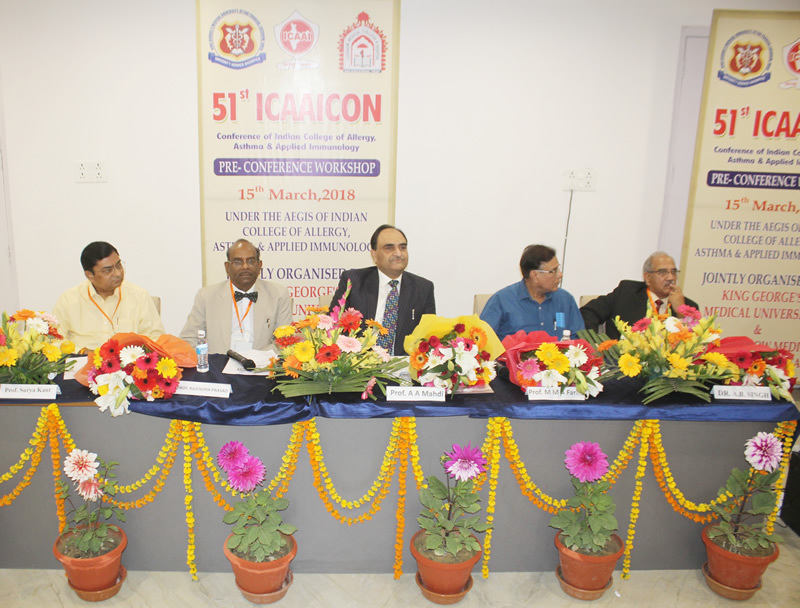 51st ICAAICON 2017 -Indian College of Allergy, Asthma and Applied Immunology, Pre- Conference Workshop was held on 15th March 2018. The Pre- conference workshop for 51st Indian College of Allergy , Asthma and Applied Immunology 2017 (ICAAICON 2017) was held at Era’s Lucknow Medical College & Hospital, Era University, Lucknow on 15th March 2018. The workshop started with inauguration of the ceremony by lighting of lamp by Professor Abbas Ali Mahdi, Vice Chancellor Era University, Prof. M.M.A. Faridi, Principal Dean & CMS, Era’s Lucknow Medical College & Hospital, Professor Rajendra Prasad, Organizing Chairman, ICAAICON 2017, Dr. A.B. 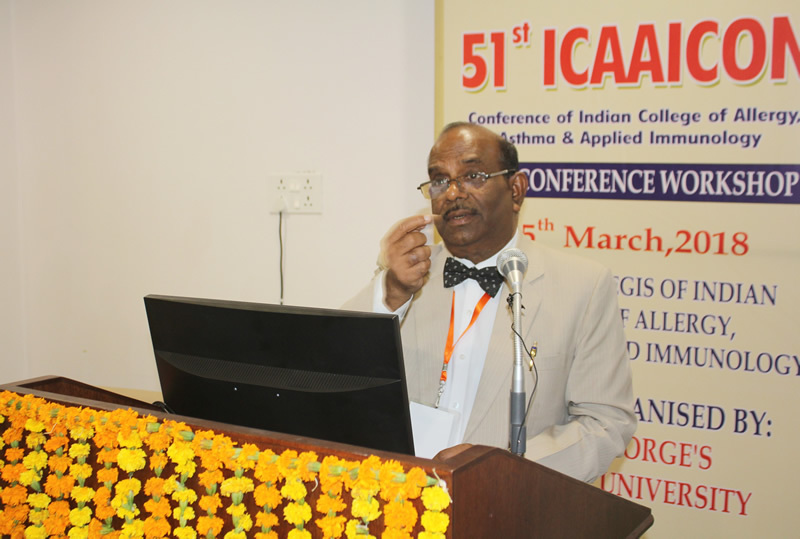 Singh, Secretary, Indian College of Allergy, Asthma & Applied Immunology and Professor Surya Kant, Organizing Secretary, ICAAICON 2017. Inaugurating the pre-conference workshop, Prof. Rajendra Prasad welcomed all the dignitaries and all the delegates and said that 20-30% of population are suffering from one or other allergic diseases. Prof. Abbas Ali Mahdi, talk about the importance of such workshop for imparting training of young allergist, pulmonologists and physicians. Prof. M.M.A. Faridi said Era’s Lucknow medical college & hospital is delighted to organize this workshop as a process of continuous medical education and training. Dr. M.K. Agarwal from Delhi talked about basic immune response in allergy, Dr. A.B. Singh talked about role of aerobiology in clinical practice of allergy, Dr. Rajendra Prasad spoke about clinical aspect of diagnosis of allergy and said that history is very important to diagnose allergic diseases. No test like Skin prick test, blood test in isolation is important. All the tests should be correlated with good history and every clinicians should know the flora, fauna and pollen calendar of their region. Dr. P.C. Kathuria spoke about laboratory investigations for diagnosis of allergy, Dr. V.K. Jain from Jaipur talked about general guidelines of Immunotherapy. The others speakers included Dr. Mahesh Goyal from Jaipur, Dr. K.V. Nagendra Prasad from Bangaluru, Dr. S.N. Gaur from Delhi who talked about various aspects of diagnosing, management and prescribing immunotherapy. Training session was started about skin prick test, intradermal skin test, patch test and prescription of immunotherapy subcutaneous as well as sublingual. 50 doctors from all over India, Bangladesh and Sri Lanka participated in the workshop.